With your help Love Your Hospital can raise the vital funds to support the outstanding ophthalmology care provided to patients. With your help we can ensure Western Sussex Eye Care | Southlands has the best, most modern equipment so that our ophthalmology team can see more patients, diagnose them earlier, treat them faster and reduce the instances of long term sight loss. Imagine not being able to watch your favourite TV show, read a book or even drive to the shops let alone being able to see the faces of your loved ones. Left untreated patients living with conditions such as Glaucoma, Wet AMD and Cataracts will over time lose their sight. 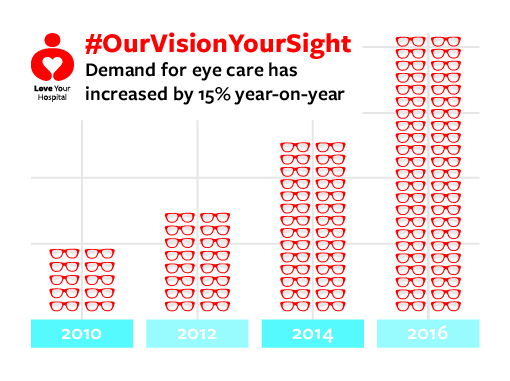 Demand for eye care is on the increase and last year alone the Ophthalmology teams at Western Sussex Hospitals NHS Foundation Trust saw over 30,000 patients. This is why Love Your Hospital is supporting the build of the new Western Sussex Eye Care | Southlands. The new centre of excellence for eye care will enable our specialist Ophthalmology team to carry out innovative treatments, with state-of-the-art equipment, helping even more patients like Daphnie.